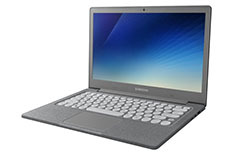 Samsung had previously released its Notebook Flash in South Korea, as part of a campaign to highlight its next-generation connectivity capabilities. Accordingly, the Flash has Gigabit WiFi, which can deliver speeds of up to 1.7Gb/s. This 13.3-inch laptop, which also has a retro typewriter keyboard, will be available in other countries soon. Samsung has unveiled its revamped Notebook Pro 9 at CES this year. However, it has also announced the Notebook Flash would become more internationally available, starting in mid-January. This device is a laptop with a 13.3-inch 1920 x 1080 Full-HD anti-glare LED Display. However, the more noticeable feature of the Notebook Flash may be its "trendy" typewriter-style keys. Then again, it also comes with the advantage of Gigabit (or 802.11ac 2x2) WiFi on-board, which may push download speeds up to 1.7 gigabits per second. The Samsung Notebook Flash also comes with another unusual spec: a combination unified flash storage (UFS) and microSD port. It also has 2 USB type C ports, a HDMI port and a headphone jack. The Flash also has a less prepossessing 64GB of eMMC storage, 4GB of RAM and a plastic outer casing. However, it also has a fingerprint reader and Notebook Pro 9-like dual 1.5 watt speakers (albeit without the ThunderAmp found on the larger laptop). This little retro-looking notebook will be sold on Amazon and on Samsung's own website. It will cost US$349.99 for an Intel Celeron N4000 variant and $399.99 for one with the Intel Pentium Silver N5000. The Korean edition of the Notebook Flash came in Linen White, Twill Charcoal and Soft Coral SKUs; however, Samsung has only mentioned the charcoal version in regard to the American market. It will be released for sale on January 15, 2019.